A late bus caused Arbor View’s football team to arrive horribly late to Liberty and forced the game to be delayed by an hour. But once the Aggies took the field, they wasted no time taking control. Christian Rodriguez scored on an 81-yard run on the game’s second play from scrimmage, and the fourth-ranked Aggies went on to top third-ranked Liberty 47-26 in the season opener for both clubs. The bus to transport Arbor View to the game arrived late, and the Aggies didn’t get to Liberty until 7:10 p.m., 10 minutes after the game was scheduled to start. The first players took the field for warm-ups between 7:15 and 7:20, and the game kicked off at 8. Just 1:02 into the game, Rodriguez put the Aggies ahead, taking the inside handoff and chugging straight up the middle for the long TD. “We kept them calm, and the kids came out, and they responded,” Barnson said. “They jumped right out and got after it. Rodriguez found the end zone the next time he touched the ball, again going straight ahead for a 30-yard run that made it 13-0 with 8:04 left in the first quarter. From there, the defense took over, forcing two turnovers that allowed Arbor View to start consecutive drives inside the Liberty 10-yard line. The first came when Joey Comish picked off a Kai Nacua pass and returned it 29 yards to the Liberty 3. That set up a 3-yard TD run by Donnie Gaskin that made it 19-0. Jordan Eggleston picked up a fumble on the ensuing drive and returned it 13 yards to the Liberty 8. Two plays later, Rodriguez scored on a 3-yard plunge, and the Aggies had a 26-7 lead. Henry Hoffend hit a wide-open Roderick Eason with a 46-yard TD pass on the next drive, and the Aggies were out to a 33-7 lead before Liberty finally got things going a bit. The Patriots scored on their final possession of the first half when Niko Kapeli had a 13-yard TD run, and Kapeli again found the end zone on the opening drive of the second half, scoring on a 33-yard scamper that cut the lead to 33-19. That was as close as Liberty would get. Eason added a 6-yard TD run in the third quarter, and Gaskin had a 35-yard scoring run with 6:55 left to seal the win. Rodriguez finished with 127 yards on eight carries to lead the offense. Gaskin added 88 yards on 14 attempts, and Eason rushed for 63 yards on nine carries. All three backs topped 1,000 yards last season. Kapeli rushed for 108 yards on 19 carries for Liberty. Nacua passed for 199 yards, including a 71-yard touchdown strike to Jeremy Lagasca. 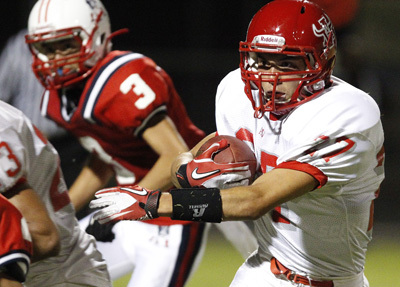 Lagasca had four catches for 104 yards for the Patriots, who made it to the Class 4A state semifinals last season. 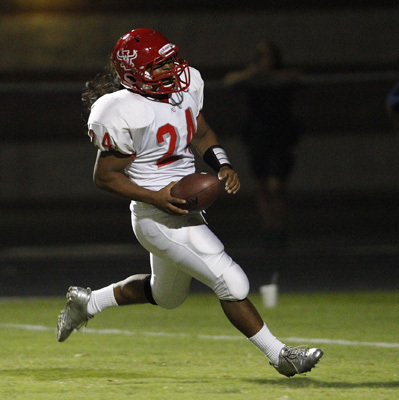 Arbor View has a short week, as the Aggies take on defending Northwest League champion Palo Verde on Thursday. The two teams met on the final night of the regular season last year, with Palo Verde handing Arbor View its first loss to win the league.